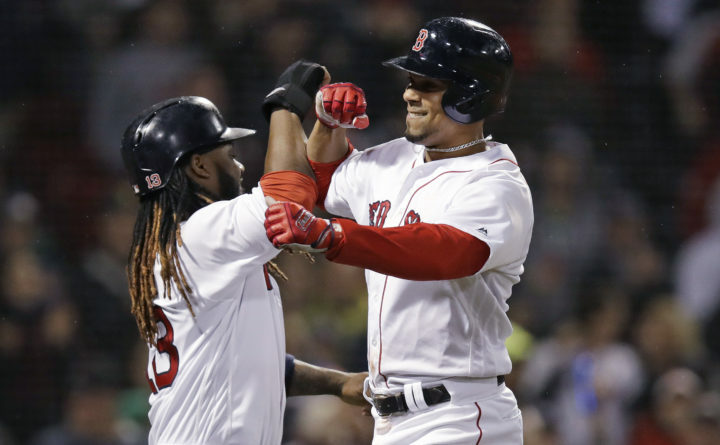 Boston Red Sox's Xander Bogaerts, right, is congratulated by Hanley Ramirez after crossing home plate on his three-run home run off Oakland Athletics relief pitcher Ryan Dull during the sixth inning at Fenway Park in Boston on Wednesday night. Chris Sale (4-1) gave up just two runs and two hits in five innings, striking out nine and walking four — his most base on balls since also allowing four on August 31, 2016. Athletics: Cahill (right shoulder impingement) was reinstated from the 10-day DL before the game and outfielder Jake Smolinski was optioned to Triple-A Nashville. “When you don’t play for an extended period-of-time, get some at-bats, you don’t feel comfortable,” manager Bob Melvin said. Cahill hasn’t picked up a win on the road — start or relief — since a victory at Colorado on August 20, 2016, a span of 24 games. A’s right fielder Stephen Piscotty made a running catch before tumbling headfirst over a short wall down the line. The play was overturned after replay review. Red Sox: LHP David Price (3-4, 4.89) is line to pitch Thursday’s opener of a four-game series against Baltimore. The game is a makeup from the Patriots’ Day rainout.